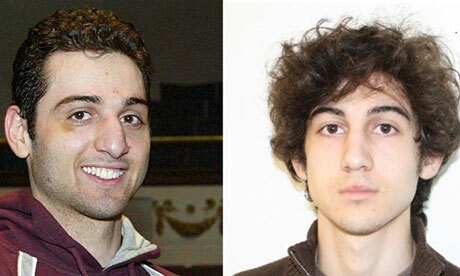 It seems that my suspicions about the motives of the Boston terrorist bombers were correct. This was not some crazy person going wild. This was a deliberate act based on Islamist/Jihadist fervor. Tamerlan Tsarnaev, and his younger other, Dzhokar carefully planned and executed it. Fortunately the death of one and capture of the other has to be the quickest end to a manhunt (of criminals of this magnitude) in US history. It also seems to be clear that Tamerlan, a once assimilated Chechniyan who married an American woman - became a radicalized Islamist during a lengthy visit to his homeland. It is still early in the investigation. But is unlikely that any new information will change the basic assumptions now being made. Radical Islam is behind the attack. I assume Dzhokar was somehow persuaded to to join him in this effort by his older brother – who was somehow also able to convince him about about the ‘justice’ of killing innocent people for ‘the cause’. Everything that has been revealed about Dzhokar so far says ‘normal’. He was a popular out-going19 year old; a completely naturalized citizen. He was enrolled in college - well adjusted and well liked. He was kind and considerate. There seemed to be no anger issues with this young Muslim. So far all those interviewed who knew him only had superlatives to say about him. They are shocked that he had anything to do with this. That a normal and seemingly well adjusted American kid can be so easily convinced to help commit a terrorist act of this magnitude is in and of itself is terrifying. In this era of the ubiquitous surveillance camera, they were quickly identified as having placed the bombs. A manhunt ensued. Tamerlan was shot and killed in a confrontational major shootout with law enforcement officials. His younger brother Dzhokar was later captured alive although seriously wounded. Hopefully he will survive and will be interrogated. There are a lot of unanswered questions. Are there any additional co-conspirators? What was their motivation? What precipitated their act? How could Dzhokar join his older brother so easily? Could this have been prevented with better security measures? How much liberty are we willing to give up for better security? …All good questions. But for me the one question that keeps coming up that I am not sure has an answer is how do we fight an idea? As of now it seems that these two brothers were not a part of any organized terrorist group. They decided to act on their own motivated by the ideals of Radical Islam. These are the ideals that are behind every suicide bomber who blew themselves up in Israel. This is the ideology behind Hamas, Hezbollah, and every other Jihadist group in the world. This is what caused our problems Iraq after we eliminated Saddam Hussein - and still causes our problems with the Taliban in Afghanistan. Just about every American soldier who was ever killed in the Middle East was killed because of Islamist radicalism. And let’s not forget 9/11. I don’t think there can be any doubt about that. Yes - there are other non Islamist radicals that can carry out terrorist bombings. That was made very clear by Timothy McVeigh in Oklahoma in April of 1995. But I don’t think it is arguable that Islamism is the biggest international threat to security in our day. More than ever the focus needs to be on the idea rather than it does on any given group carrying out terror. Whether it is Al Qaida or any other group. This should be painfully obvious after the events in Boston last week. You don’t need more than one person to carry out a major act of terror. Not that Al Qaida should be ignored. But it is the idea that motivates them that ought to be the main focus of counter terrorism. This is something that anyone with half a brain should have known for the longest time. But in our politically correct world, connecting terror to a specific religion is counter to one of America’s most sacred values – religious tolerance. Government officials are therefore loathe to mention Islam and terror in the same sentence. While I agree that we ought not castigate an entire religion for the acts of a few, it makes no sense to overlook the obvious. I am the first to say that the vast majority of Muslims living in America are not terrorists. Most of them love this country and want to live peaceful lives while practicing their religion freely. This does not mean that they aren’t anti-Israel. I’m sure that most of them are. They buy into the narrative of Israeli occupation being the source of all evil. But most of them would never support terror in pursuit of what they perceive to be justice for the Palestinians. But the root of worldwide terror is in Islam’s radical religious element. Ignoring this simple fact because of political correctness may be our biggest folly. That said Muslims in this country ought not be persecuted. On the contrary. They have the same right as anyone else to pursue happiness and practice their religion in this country. But even they must realize the extent of Islamist extremism. Extra vigilance about Muslims living in this country must be part of our security considerations. Muslims themselves can be just as easily victimized by terrorist bombers as anyone else. A truly patriotic Muslim should therefore be the first to condemn it and understand why their community gets more scrutiny. They should welcome that. I’ll bet that some of them actually do welcome it. If there is any silver lining here, it is that the media will hopefully finally realize what I have from the very beginning. That it is Islamism that is the enemy and not Al Qaida Al Qaida is but one ‘tool’ of many dedicated to the cause. There must be hundreds more like them. Who knows how many sleeper cells there are! Some Jihadist groups might only have two members as was most likely the case with the Tsarnaev brothers. There are a number of Jihadist websites that are dedicated to recruiting innocent Muslims into their cause and provide simple instructions on how to build devastating bombs with easily obtainable household items. How stupid must the media have been not to have seen all of this till now? These websites did not happen yesterday. Well at least now it is being noticed. Much of the commentary I’ve seen since the bombing seems to finally be getting it. And that is a good thing. I just hope that this new realization does not wear off so that we end up going back to a political correctness that ignores the real danger. If it does, then we will have learned nothing from what happened in Boston last week.